The iPhone uses plenty of motion effects when you tilt your Home screen. Leaving this on can run down your battery and has led to some reports of causing motion sickness. 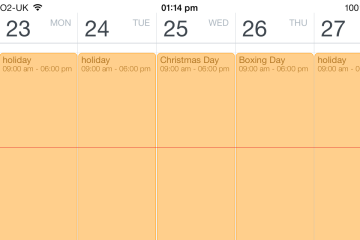 To quickly see all your upcoming appointments, tap the Magnifying Glass icon from the top to reveal a timeline view. This can give you a better overview of all your future events without having to navigate through everyday. Get more details about the current forecast in the Weather app. From any location page, tap the temperature at the top of the screen to reveal Humidity, Chance of Rain, Wind, and Feels Like. Tap again to switch back to the temperature. If you’re traveling to a new location, it’s possible to see what apps are popular in that area. First open the App Store, select the Near Me tab and enable this feature. Now open the Maps app, tap on any place listing and tap the name. This will then show you apps that are being downloaded in the local area. These apps are usually related to travel or landmarks in that city. Make sure to download them before arriving to scout ahead. By default, the Music app will show all your purchased music, whether it’s stored on the device or in iCloud. It is possible to hide any music that is stored in iCloud though. To do so, open Settings, Music, then turn off the Show All Music option. To get at your iCloud music, you’ll now have to open the iTunes app, tap More, then Purchased followed by Music. Select an artist and tap the cloud with an arrow icon to download.